One World Identity (OWI) is an independent advisory firm that helps business leaders, governments, and investors stay ahead of market trends. 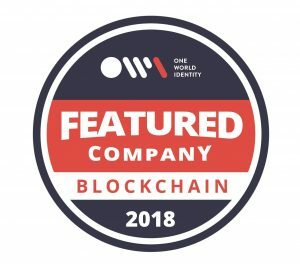 In August, OWI released its latest research on blockchain in a whitepaper titled, “Blockchain and Identity in 2018: A Year of Promise and Pilots.” The paper highlights 18 companies and organizations at the forefront of blockchain identity technologies and innovations. The Sovrin Network is an open source, public-service utility built to enable self-sovereign identity. Sovrin’s infrastructure also allows users to manage identifiers, keys and credentials as a complete and easy-to-use decentralized identity system. Stewards range from governments and credit unions to companies like Cisco and IBM. The complete list of featured companies includes: Evernym, Hyperledger, IBM, R3, ID2020, Sovrin Foundation, Civic, BanQu, Cambridge Blockchain, ShoCard, ObjectTech, Tierion, uPort, Datum, Dominode, Pillar, Procivis, and Sphere Identity. To download a free copy of the report, visit: http://oneworldidentity.com/blockchain-and-identity-in-2018-a-year-of-promise-and-pilots/.